There has been justifiable concern recently about BPA leaching from baby bottles into the baby’s formula. The available data indicate, however, that liquid formulas may be a more potent source of infant exposure to BPA. BPA has been detected in 16 of 20 liquid formula samples tested by FDA and EWG. Concentrations range from less than 1 part per billion (ppb) to 17 ppb in these samples, with an average of 5 ppb (EWG 2007a; Biles 1997). Although the data from the FDA are now 10 years old, EWG found no information indicating that formula containers has changed significantly since then, and our recent testing finds quite similar results. Baby bottles have been more extensively tested. We found 11 studies testing BPA leaching out of polycarbonate baby bottles, reviewed by the EU Food Safety Authority or NIH review panel (EFSA 2006; CERHR 2007b) and 1 test from an advocacy group (Environment California 2007). Baby bottle tests were often designed to measure the amount of BPA that leaches out over many washing cycles. As a result, most use water heated to 100 to 200 degrees, much hotter than any liquid fed to real babies. Thus the concentrations of BPA measured reflect aggregate exposures over time, not the amount of BPA that would be released in a typical feeding. Three tests using water between 78 and 104 degrees found no detectable BPA in bottles. 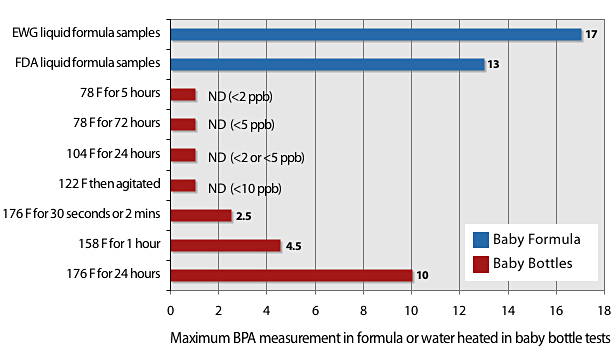 Nine tests using 122 to 212 degree water found varying amounts of BPA. Of these half measured BPA levels lower than the concentrations in liquid formula, and half had higher BPA. However, since these tests reflect BPA leaching out of bottles over many wash cycles and not necessarily in liquids fed to babies, we conclude that liquid formulas present a more direct risk of BPA exposure. ND = not detected, value in parentheses is the detection limit.